This children's book introduces the military aircraft known as the F-18 Super Hornet, along with its missions, equipment, weapons, and use in the military. This book is a top quality children's book with Library/Hardbound binding. Originally priced at $21.95, this book is a top quality value-bargain! 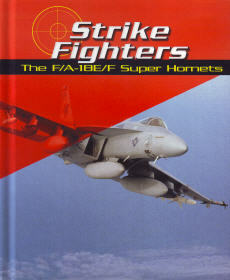 Strike Fighters book: Reading Level: Grades 3-4, Interest Level: Grades 3-9, Ages 9-12, 32 pgs, hardbound w/Library Binding. TOP QUALITY.